The circus is back in town! 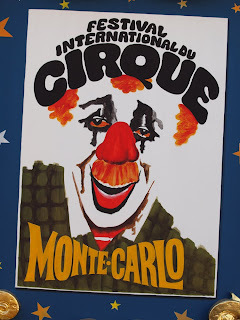 Monaco's famous International Festival of Circus is in its 35th year. Each day the clowns board the special circus car and drive around the Principality - here's one of them, make up ready but not yet in full costume. The Monte-Carlo International Festival of Circus is an incredibly prestigious event amongst circus folk and it is Princess Stephanie who has the final say as to which acts from around the world (comedy, acrobats and animals) will be invited to perform and compete for the various awards. Her father, the late Prince Rainier, was passionate about circus and so is the Princess. You see her around the circus all day long, chatting with the performers and trainers and making sure everyone, including the animals, are happy. Seems like a fun and funny job! 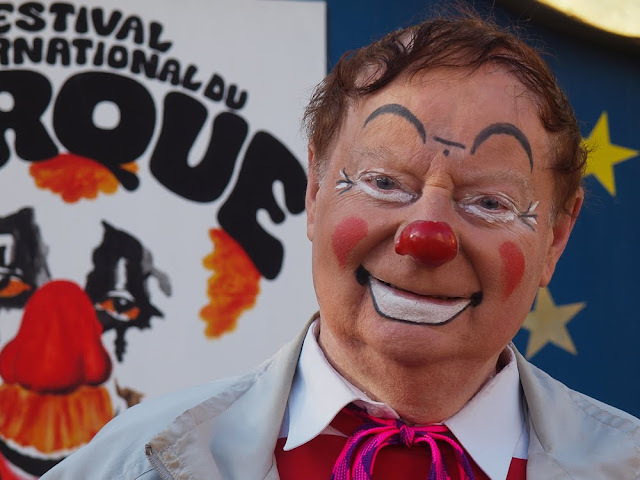 Different make up than one normally sees in Monaco, non? A good photo. I know that I'm probably not supposed to react this way but I find clowns to be real creepy. I wonder if anyone else feels this way, too? Very funny, Leif! And Kate, yes clowns can seen a little creepy but this guy was an absolute teddy bear!